What is wonderland in your heart? Disney Land? For me, it is definitely Tamagochi. So this post will be highly about my hobbies. Let me warn you that people are talkative when it comes to hobbies! It is a toy to raise a virtual/digital pet on your hand, released by Bandai, one of the Japanese leading toy companies. 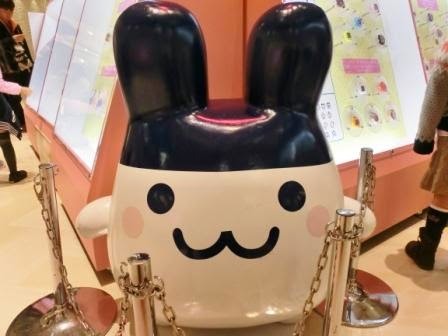 With being introduced by a popular Japanese singer on TV, and by word of mouth, Tamagotchi’s popularity among kids, teenage girls and even adults spread all over Japan and in 30 foreign countries. It was so popular that the market was always short of the products. Especially popular colored Tamagotchis such as this first white ones were priced more than 10 times as the true price. Talking about my own sweet memories, Tamagotchi was my childhood itself. I was totally absorbed in hatching eggs (= tamago in Japanese,) raising those pretty, simple and mysterious pets on my little hand. My favorite one was not the one in the photo, but a white one with pale pink and blue spiral patterns. And my favorite character was Mimitchi. I’d read Tamagotchi picture books about their home planet. I’d collected stickers and stared at them for hours. Tamagotchi’s town was like an amusement park. Speaking houses. Sea of juice. Star ships. Even hospitals are amusing. And the planet itself is living, too! Pokemon was popular among my friends at the same time, but I loved cute Tamagotchis better than Pokemons, who always had matches. I knew Tamagochi world more than anyone in my class. Tamagotchi was a treasure box of imagination. Bandai failed to manage the unexpected boom, so, to my sadness, Tamagotchi disappeared in 3 years. 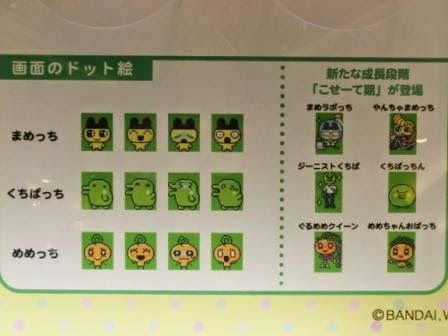 However, they caught a rumor that Tamagotchi was still popular among some high school girls, so they planned a lot this time. Finally in 2004, Tamagotchi returned to the earth! After that, Tamagotchi appeared on many kids’ magazines, has had 2 anime movies and some Nintendo 3DS games. TV anime program is on-air now. For me as an old fan, I find some differences from the original. For example, there was not any idol Tamagotchi on Tamagochi planet I used to know. No jewel-like-heart-shaped-beads on Tamagotchi series I’d love in my childhood. It’s times. But I believe it is still a world of wonder at the bottom. 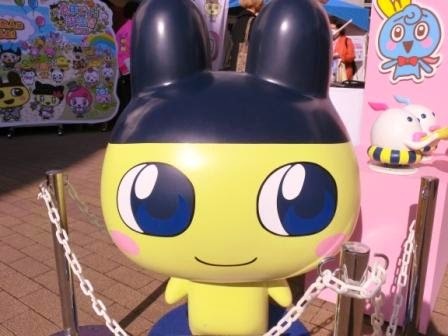 Plus, I am so happy to meet my beloved Mametchi and Kuchipatchi again. So I decided to visit Tamagotchi 18th Anniversary Event in O-daiba! It was held at Diver City Tokyo Plaza, one of the 4 big shopping centers in Odaiba. 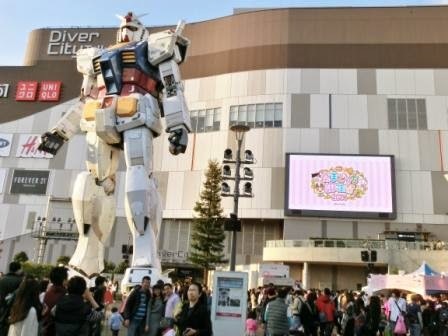 Diver City is known with the Full-Length Gundam in the garden. Tamagotchi Birthday is on the screen. , the latest verstion, there. I was impressed that the developments of technology has enabled us to get close to Tamagotchi planet. When I was a big fan of old Tamagochi, they used to be displayed like these. Monochrome, a few dots. All I did for them were taking foods to them, play with them, discipline and healthcare. Beautiful!! A lot of expressions! Today’s Tamagochis live in a colorful room with Tamagotchi planet furniture and go out to restaurants, shops, parks and game centers on our hand! It’s true that things have changed. The wonderland, a treasure box of imagination, has come to my hand! And one thing surprised me. Ariana Grande, an American pop singer with super high tone voices, is singing the ending theme song of “Go-Go Tamagotchi!” the TV anime. Undoubtedly, Ariana Grande is a worldwide singer. Her latest album (November 2014) My Everything – Ariana Grande was on the TOP of the hit chart in the US. Talented as a vocalist, she is now called, “Next Mariah Carey.” More about her career, please go to her Facebook, Twitter with more than 21 millions of followers or official website. Yes, she is a Super Star. It is very abnormal that an English song is featured in an anime because theme songs have to describe and carry the anime characters’ feelings and dreams to people watching it. It’s too difficult and painstaking in leisure time for people, especially children, to understand words in a foreign language. It is not time to study English! Why on earth did it realize, then? Actually, Ariana Grande is a big fan of Tamagotchi, and when she visited Tokyo in January 2014, she went to Tamagotchi Department Store in Harajuku and got a lot of items there. When Bandai Tamagotchi staff members learned so, they were so pleased and gave an original strawberry-designed Tamagotchi as a present to the American diva in February, when she visited Japan again. She got impressed with it, too. After that, Tamagotchi anime team offered her that she would sing the ending theme song and Ariana willingly consented to it. “Baby I,” the super hit song, featured Taro Hakase, a popular Japanese violinist who often collaborates with pop singers. At last, the cute, cool and stylish ending anime was completed. I believe that it was a challenge to mix up Baby I, an American R&B song, with an anime. It is quite new for the entire of Japanese anime industry. Now in the story, one of Mametchi’s friends is a violinist, so I suppose little children can explore Tamagotchi world even if they can’t understand English. The ending video is completed to be visually fun, dreamy, colorful and cute. I think it’s surprisingly successful. It was a breakthrough as well. Tamagotchi Department Store in Harajuku was under renovation and is going to re-open on 29 November, 2014. The very front of Takeshita Street! It’s the coolest street in Japan and many international tourists visit there. I’ll visit there as soon as possible. Tamagotchi has come back to my life and gave me a lot of dreams, wonders and imaginations. Love you! And thanks to you, too! Access: 3 – 5 minutes walk from Daiba Station of Yurikamome Line or Tokyo Teleport Station of Rinkai Line. Stay in Odaiba – Both of Grand Pacific Le Daiba and Hotel Nikko Tokyo are superb hotels with stunning panoramic views of Tokyo’s bay side area. Accommodation Guide: Stay in Oimachi or Shinagawa – Just get on Rinkai Line from Oimachi to Tokyo Teleport, and Odaiba is very near. From Shinagawa, there is a free shuttle to Odaiba. Diver City Tokyo Plaza Official Website – Can choose English, Chinese and Korean. Diver City is quite friendly to international tourists with international ATMs to withdraw cash, currency exchange counters and English menus. Baby I (feat. Taro Hakase) – My Everything – You’ll get surprised that the violin is so cool on this song. (Ariana herself says so, too.) It is a bonus track of Japanese My Everything CD/Downloads. Try it on iTunes ! That's fantastic! I haven't seen anything about Tamagotchi for years and I thought they'd gone forever!! Can't wait for you to show us what the new Department store is like! So happy that Tamagotchi is worldwide again! And happy that you know them as well!! I'm looking forward to visiting Harajuku for the new Tamagotchi Department Store. What a fantastic autumn this is! thanks for this… im a huge huge fan of tamagotchi from spain. 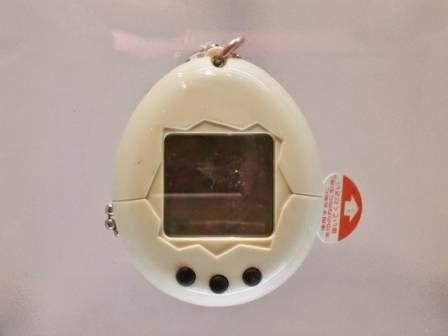 it's so sad they decided to stop making the new tamagotchis outside of japan… here the last one is still in black and white! i heard its still popular amongs some kids. 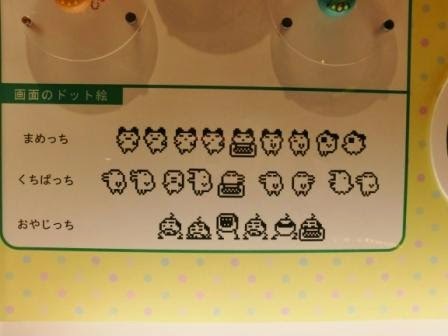 i was in japan last year but the new store wasnt open yet, i bought tamagotchi ps back then and i managed to translate it into english, its a great tamagotchi! i love it… and im going to tokyo again next july so i will be buying new tamagotchi 4u that unfortunately can't be translated yet. but id still love it and i also buy every plushie and toys about tamagotchis, they're adorable. the only thing i really dont like is the direction the whole tamagotchi thing took some time ago, when it went into a strongly girly thing, when it was supposed to be neutral. original tamagotchis were weird, cute, adorable and gender-free, but now they are "boys" and "girls" and the whole theme is a girly thing. i dont hate girly things, but i dont think tamagotchi needs to be a girly thing. tamagotchi ps was ridiculously girly, with fake jewelry in the cover and some horrible characters a bit too overdone… im happy to see the new 4u is a bit more neutral. i'd love to see the tamagotchis go in this direction and get all the attention and popularity they deserve! i enjoyed this review and i wish i could have gone to this event, but im happy i will be able to see the new tamadepa next july! hooray!! I really, strongly agree with you. Tamagotchis became too girly some years ago and I once "graduated" from tamagotchi then. I suppose it was because some animes that Bandai involved were about girls in dresses and jewels who become popular idol singers. Things like that were trends for little girls at that time. So I felt, "Oh, tamagotchis will be an average hit for some months or years by going along the trends. But they lost their originality. They are not tamagotchis I used to love." But now the trend of idol singers is not as hot as some years ago, so I feel tamagotchis are going back from being too girly. I still feel some characters are too human-like, but I think that Bandai pays more attention to the originality of tamagotchi planet than past few years. In my opinion, tamagotchis should have several brands inside; For example, there is a series of weird and cute and neutral tamagotchis for old fans like you, and there is also a girly series going along trends, and so on. I wish tamagotchi will be reached from little children to grownups. Well, have a great trip in July with my Tokyo Direct Guide & Diary!